Liturgy check in your parish, what color vestments did your presider wear today? Pope Benedict XVI commemorated his predecessor on Sunday by quoting a passage on Christian love from a homily that the late John Paul II should have recited on April 3, 2005 - a day after his death last year. "To humanity, which at times appears lost and dominated by the power of evil, egoism and fear, our risen lord offers in gift his love, which forgives, reconciles and opens our heart to hope. It is a love that conquers the hearts and brings peace," said Benedict, quoting John Paul's planned homily. "It was written in the divine plans that he should leave us on the eve of that day, Saturday April 2, as we all remember. This is why he was no longer able to utter these words, which I want to recall today to all of you," Benedict said while addressing the faithful gathered in a parish in Rome created under John Paul's pontificate. "In this sort of testament, we are invited to understand and embrace the divine mercy (of God)," Benedict said. It's not "pink," kind sir. It's "rose." To make rose, I think that they combine red and white (making pink) and then add a third color (green?) to make the pink start to trend toward brown. Voila -- rose. While most Catholics will see rose vestments this weekend, they are not absolutely required. Violet may be worn. In many parts of the world, priests don't have enough money to buy rose vestments to use just two days per year. Purple on the San Francisco Peninsula. Purple here in my parish in Melbourne Australia. "in God" should be in brackets, not parenthesis. I'd say most parishes would not have Rose- priests are too apathetic to care most of the time. The bare minimum is whats best for them. 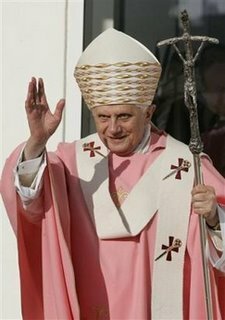 I even think that the Pope's MC (under JPII) had him in Violet instead of Rose. Its not in vogue with trendies.